The Indian Ocean gyre, located in the Indian Ocean, is one of the five major oceanic gyres, large systems of rotating ocean currents, which together form the backbone of the global conveyer belt. 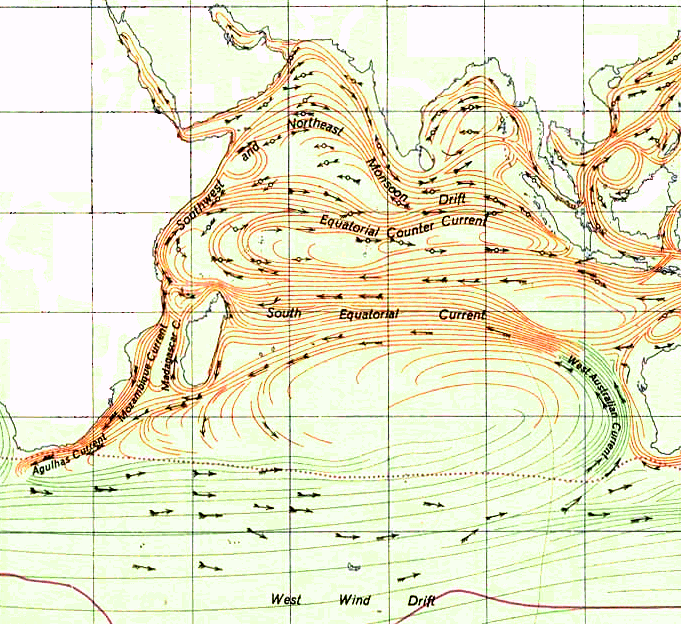 The Indian Ocean gyre is composed of two major currents: the South Equatorial Current, and the West Australian Current. Normally moving counter-clockwise, in the winter the Indian Ocean gyre reverses direction due to the seasonal winds of the South Asian Monsoon. In the summer, the land is warmer than the ocean, so surface winds blow from the ocean to the land. However, during the winter, these temperatures reverse, making the winds blow from the land to the ocean. Because most of the air pressure gradient is retained behind the Tibetan plateau, air pressure gradients over the Indian Ocean and the gyre are small. This results in winds of moderate strength, due to the protection from the full force winds blowing off the Mongolian high pressure region. Because of these moderate, dry winds, the Winter Monsoon season in the Indian Ocean region is the dry season for most of Southern Asia. Due to this seasonal wind cycle, the currents of the Indian Ocean, which make up the Indian Ocean gyre, are directly affected, causing reversal. Like the other gyres, it contains a garbage patch. A garbage patch is a suspended region of marine debris within the water column that circulate the gyre constantly. The Indian Ocean’s garbage patch covers a massive area: at least five million square kilometers (two million square miles). As garbage patches such as these circulate for long periods of time, they cause inorganic toxins to enter the food chain due to solar breakdown of plastics in the water. In the Indian Ocean gyre, the garbage patch has been more of a mystery. Having just been discovered in 2010, it is still under research. It is known, however, that like most garbage patches, it is very fluid, and changes with the seasons, making its location difficult to pinpoint. It seems to circulate with the Indian Ocean gyre, from the Australian side to the African side, down the African coast, and then back to Australia. According to the team who discovered the garbage patch, the full rotation of the gyre’s garbage patch takes about six years, until it reaches the center of the gyre, where it may remain indefinitely. 1 2 3 Plane Search Shows World's Oceans Are Full of Trash. National Geographic.